Children have the opportunity to receive three sacraments during their time at Our Lady & St Kenelm School. 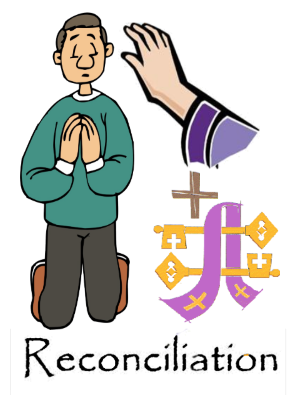 The preparation for each sacrament takes place during religious education lessons and there are also meetings between school, parents and the parish priest. This is usually received by Year 3 children during Autumn Term, before Advent. The ceremony takes place on a Saturday in the parish church during a prayer reconciliation service, where the children are presented to the priest by their family. This is usually received by Year 3 children after May half term, having received the Sacrament of Reconciliation during Advent. The whole class join in a celebration of their sacrament with the parish community the First Holy Communion mass, held at Our Lady & St Kenelm Parish Church. It is followed by a Communion breakfast in the School Hall. Catholic boys wear a suits with a white shirt and buy a red sash and a red tie embroidered with the year (details about ordering will be given out at meetings). Catholic girls wear a white communion dress. Girls should avoid wearing gloves or having anything to carry during the mass e.g. bags, parasols etc. We are an inclusive school and encourage all non-catholic children to join in for preparation as well as attend the mass on the First Communion Mass. Non-Catholic boys can wear a suit and a tie of their own choice. Non-Catholic Girls can wear a party dress of any colour. At the First Holy Communion Mass, these children will receive a blessing from Father. On the Tuesday School Mass after Communion, the children are encouraged to re-wear their communion clothes to celebrate their Mass of Thanksgiving in the School Hall with the rest of the school family. The Mass for the Sacrament takes place in Our Lady & St Kenelm Parish Church. Preparation is undertaken primarily by the class teacher, aided by the RE Lead. The children begin their preparation with a Mass of Commitment at the Parish Church, and also celebrate with a Mass of Light, which takes place in either the school or church.